Japan’s Mao Asada performs to “Puttin’ on the Ritz” at the 2016 World Figure Skating Championships Gala. 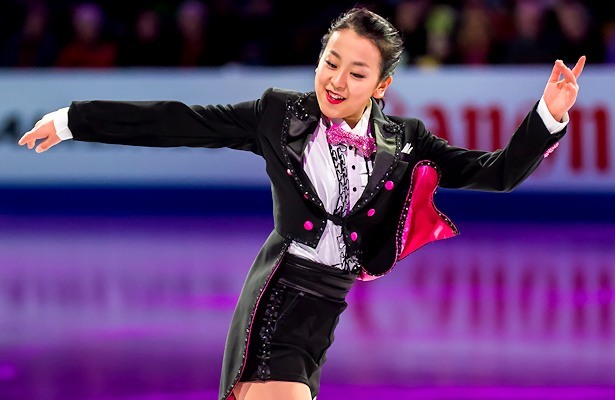 Exactly one year ago, Japan’s Mao Asada, who had been taking a rest from competition since she claimed her third world title in 2014, announced that she would come back to compete for the 2015-16 season. She was able to enjoy the feeling of achievement again when she helped Team Japan to win the Japan Open in early October with a lights-out free skate. The following month, she won gold at Cup of China, the event where she showcased consistent triple Axels. However, the skater with 15 Grand Prix (GP) gold medals struggled to pull off a complete performance at the following NHK Trophy and GP Final, popping and under-rotating several jumps. Asada managed to get a bronze medal in Nagano, Japan, but in a highly competitive field in Barcelona, Spain, the four-time Final winner settled for sixth. That was when the feeling of disappointment started to hit the skater. In fact, the six-time Japanese champion was thinking about a complete retirement during the time of the Japanese Nationals in Sapporo, Japan, at which she finished third. However, her thinking started to change when she was assigned a spot to the 2016 World Figure Skating Championships. In January, the three-time Four Continents winner decided to withdraw from the event this year in order to better prepare for upcoming worlds. In the final week of March, Asada went on her ninth trip to the Worlds in Boston, Mass. Her short program did not go well as she stepped out on the opening triple Axel, and the landing of the triple loop was shaky. As a result, she was placed ninth in the segment. “I feel regrettable for my triple Axel, but I think I skated the way I wanted for the rest of program,” the skater commented. In the free skate set to the music of Madame Butterfly, the three-time world champion pulled off a more complete performance of her difficult season. Except for popping a triple Lutz into a double, and receiving a few under-rotation calls, she executed the planned elements well, and all her spins and step received level-four and good Grades of Execution (GoE). The skater who finished seventh in the segment and overall was satisfied and felt relieved that the season was finished. In retrospect of the comeback season, the skater who called herself as a “veteran of the sport,” considered that her experience over the years helped improve her artistry. Despite being the second oldest skater in the competition, Asada doesn’t think age is a big problem. The skater also raised the examples of the silver medalist at this event, Ashley Wagner (who turns 25 today), and Carolina Kostner who won a bronze medal at the 2014 Olympics at the age of 27. “What they were able to achieve in such a young field motivates me to work hard,” said Asada. Looking into next season, the two-time Olympian is determined to improve her techniques. When she announced her comeback last year, the 2010 Olympic silver medalist said she wasn’t thinking about next Olympics in Pyeongchang, Korea, however, Asada is feeling the competitive fire again. The skater is currently working with Lori Nichol in Canada on her new programs and plans to make an appearance at the THE ICE, a show that will be held in Japan in late July.